On a recent trip to NYC, Jud & Denise Pins came upon this sign in Time Squares produced by Creative Surfaces several years ago. 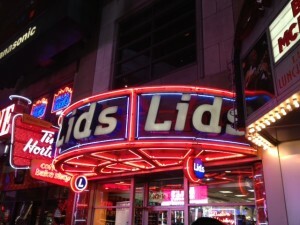 Yes, the “Lids” Exterior Commercial Signage is still there and is brightly lit. This is just one of the many signs we at Creative Surfaces have produced over the years. Not only do we have the capability of producing commercial exterior signage, but all types of signage. We pride ourselves on being one of the largest sign manufacturers in the state of South Dakota. And, we work with national clients all across the United States; every customer and project is unique in concept and design. All of our signs are “custom” designed and built. Our team of graphic artists, CAD draftsmen, and skilled production team bring those concepts to life! If you have signage needs, let our team at Creative Surfaces help you. Our sign division has state-of-the-art equipment to produce the best quality signs in the industry – including but not limited to: casino signs, exterior commercial signage, interior signage, monument and pylon signs. No project is too big or too small….let us design your next sign project.